The Webby Award winning Super 8 iPhone, iPod Touch, and iPad app brings a cool, retro vibe to your iPhone’s video capabilities. 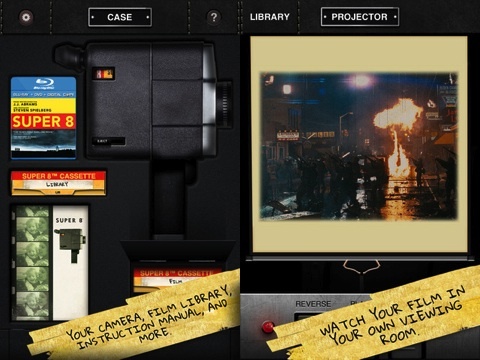 By incorporating vintage graphic touches and intuitive functionality, you can quickly view your 21st century life through the same lens brilliantly used in the Super 8 movie. The Super 8 iPhone app has a visually interesting and appealing home screen. You can purchase the Super 8 movie, create a Super 8 style movie, access an instruction manual, and check out your Super 8 iOS app. When you make a selection with a finger gesture, sounds reminiscent of pulling film from a reel complement the movement through the app. The instruction manual is navigated with finger swipes and contains helpful, concise information. The question mark icon in the upper right corner of the home screen is a fantastic tool and feature iOS app developers should emulate. When you press it, bold yellow pop-ups succinctly explain the function of the tools and icons on the screen. This great navigation tool makes for a speedy introduction to the Super 8 iPhone app’s functions, and fortunately, it follows through to the other screens throughout the Super 8 iPhone app as well. The fun part of the Super 8 iPhone app is creating your own Super 8 style film. The excellent interface lets you film quickly with a touch on the red start button. You can vary light, effects, and framing by touching the magic wand icon and the flash icon. Another icon controlled with a touch adds a grainy texture to the film. When you complete filming, you are presented with a list of scenes, film name, and credits. Using gesture controls, you touch the credits box. A great cork board screen with a keyboard pop up to give you the chance to craft your credit’s text. You can increase or decrease the time of credits with a dial adjustment as well. The credits are added as a scene to your film when complete. With a touch, you can also name your film. You can delete scenes by pressing an icon in the top menu bar as well. When you have made your final adjustments, your film is saved to your library. A neat touch is the projector screen you pull down with your finger to view your movie from within the Super 8 iPhone app. You can share via Twitter, Facebook, YouTube, and email as well. The Super 8 iOS app not only produces a wicked video, but also provides a fun, intuitive experience for you at a great price. 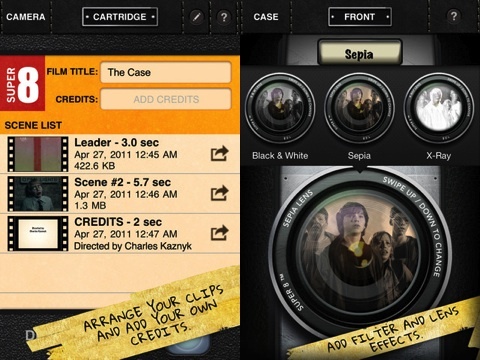 AppSafari review of Super 8 was written by Jenni Ward on June 27th, 2012 and categorized under App Store, Featured, Photos, Video. Page viewed 3812 times, 1 so far today. Need help on using these apps? Please read the Help Page.